Historic Sports Racing Ltd. is back at Sebring International Raceway with its armada of classic competition machinery for the four-day Sebring Historic Races event, Dec. 5–8. The four-day event started with testing and practice on Thursday, then moved to the first two rounds of qualifying on Friday, with the day finishing with one of the more exciting competitions, the Night Race. As always, the field featured cars from the past fifty years of the sport, from a pair of 1966 Shelby GT 350s and a 1964 Jaguar XKEs to a 2007 Pescarolo-Judd and a 2005 Audi R8. 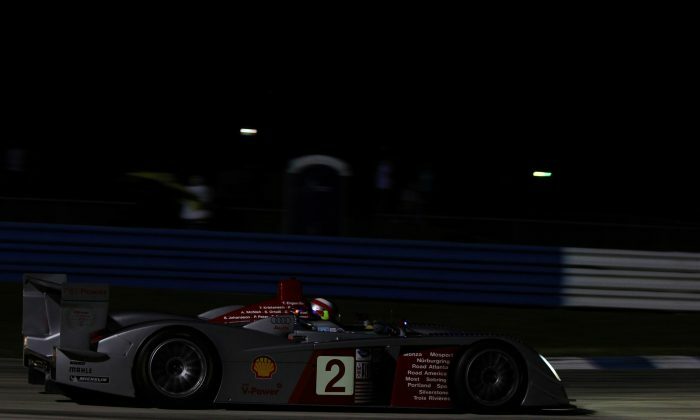 The night race is particularly challenging for the drivers because not only is there a huge variety of cars with drastically different speed potentials, the Sebring track, like many classic road-race facilities, is lit in spots and totally dark in others, forcing drivers to adapt from overhead spotlights to headlights. Meanwhile the track changes as it cools, so a driver never knows how much grip might be available from one lap to the next. Not surprisingly it was Travis Engen in the #2 Audi R8, already a winner at many of the world’s top endurance races, which finished first in the night race ahead of some stiff competition from Jamison France in the #54 2005 Chevy-powered Daytona Prototype, Andre Neibich in the #11 six-liter 1999 Riley & Scott, and John and Paul Reisman in the #9 three-liter 2002 Lola B24/40. Prior to the Night Race, the Jack Lewis Enterprises International/American Challenge brought back the late Sixties and Early Seventies—think the glory days of Trans Am, Ford at Le Mans … The track was packed with beautiful machinery, American muscle cars squaring off against the Porsches, BMWs, and Datsuns … There were too many winners in too many classes to list them all, but the sight and sound of these cars in action called up times most race fans have only read about. The final qualifying session starts Saturday morning, with group races all afternoon Saturday morning. The remaining group races run Sunday morning, and Sunday afternoon is devoted to the Four Hours of Sebring, a mini-endurance race with pit stops tire and sometimes driver changes, which will put a little of everything on track, from vintage GT machines to classic open-wheelers and some sports racers from the GTP and WSR eras. HSR Sebring weekend is always an enjoyable event. The cars are legendary, the atmosphere is relaxed (no paddock passes necessary—fans can walk right up to the cars and chat with the drivers, most of whom like nothing better than to talk about their cars and their racing adventures,) while the racing is serious, and seriously exciting. Tickets, camping and RV sites are available though the HSR website.